This has got to be one of my favorite Thai dishes. Americans really get into their Super Bowl Party foods like buffalo wings, jalapeno poppers, super nachos, pizza, etc. Many Thais would consider dishes like this Gap Glaem กับแกล้ม (I’ve never heard the “L” pronounced), or foods to be eaten along with alcohol. These include several different Yams, dancing shrimp, salted nuts, fried strips of beef or pork–finger food with a spicy kick is best. Yam Pla Duk Fu is more of an Essan dish than central Thai but can found just about anywhere. It can be eaten as Gap Glaem or as one of the many dishes on the shared Thai table, along with rice. For a another picture of a stand selling this dish, click here. 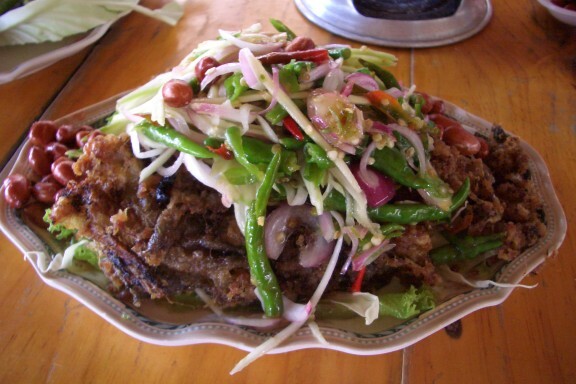 A Yam is a spicy salad and this one features crispy catfish. Pla Duk ปลาดุก (Clarias batrachus) is known as the Walking Catfish in the US. You tend to see this fish in over-sized aquariums in doctors’ waiting rooms or read about it causing traffic jams in Florida. This is not the catfish that some folks tend to associate with Collard Greens and Hush Puppies though that fish would probably work just as well though the texture is not quite as firm as Pla Duk. You may be able to get Pla Duk in an Asian market in your area. If not, tilapia, cod, haddock or any other medium-firm textured fish fillets should work. Trout might be quite tasty. There’s also a recipe for this using canned tuna floating around but I think I would pass on that one. The fish should also be cooked before frying. Either steam, grill, or bake it until it flakes into nice chunks. In Thailand, the Pla Duk is grilled and the meat removed before frying. Once the fish is done, flake it into pieces (about the size of crab meat or maybe shredded wheat) and spread the chunks on a paper towel to cool. In a small bowl, mix sugar, fish sauce, minced peppers and lime juice and mix well until sugar is dissolved. Add the mangoes slices and shallots and mix. Taste this as you add the ingredients. It should be sweet, sour, salty and spicy, and crunchy from the mango but this should soften in the mix but you should adjust the taste to your liking. Set the salad mix aside. ฟู or Fu is Thai for fluffy. A freshly washed, dried and combed French Poodle is Fu-Fu. As our fish has already been cooked, all we’re doing here is putting the Fu in the Pla Duk Fu. Heat the oil in a wok or skillet over medium heat until hot. You don’t need to fry the fish too long, just long enough to get it crispy and golden brown; just a minute or two. Once crispy and golden brown, remove from the oil and place on a grill rack or paper towels to remove the excess oil. Add the peanuts to the salad mix and mix it all up. Normally, the head and tail of the catfish are placed on opposite ends of the serving dish and the Fu’d up fish meat is placed in the middle with the sliced peppers and cilantro placed on top. It makes a nice presentation but you can skip this is you don’t like to look what you’re eating in the eyes. The salad is usually served in a separate bowl on the side, similar to the way BBQ and sauce are served in Texas. Some folks pour the salad mix over the fish and then mix all the ingredients together. Others place a nice chunk of fish on their plate, then spoon a bit of the salad mix on top and then eat, with rice, or not. Mixing it all together can reduce the crispness of the fish if you eat slow but that’s not a problem in my house as it all disappears in a matter of minutes.